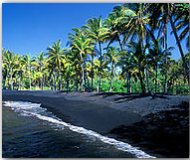 Hawaii covers 10,932 square miles containing 8 main islands and has a population of 1,211,537 people. Hawaii’s capital is Honolulu, which has a population of 371,657. Other important cities are Hilo (pop. 40,759), Kailua (pop. 36,513), Kaneohe (pop. 34,970), Pearl City (pop. 30,976) and Waipahu (pop. 33,108). Hawaii was admitted to the Union on August 21, 1959 as the 50th state. The state flower is the “Hibiscus” or “Pua Aloalo” and it’s nickname is “Aloha State”. Hawaii’s economy is broken into two categories; agriculture and industry. Sugarcane, pineapples, nursery stock, livestock and macadamia nuts provide for the agricultural side. While tourism, food processing, apparel, fabricated metal products, stone, clay, and glass products provide for the industrial side.